Tool changes in seconds, fewer machines on the worksite. Higher production rates. More profit. The right tool for the job. Lower transport costs. No oil spills. Improved safety. No protected hose run. These are the major advantages when using a proper, fully hydraulic, automatic quick coupling system. Here we outline the latest developments from suppliers in this year’s PDa feature on quick coupling systems for demolition excavators. The working environment for demolition excavator operators is steadily getting better and better. Cabins are being improved with more space, visibility and better protection from falling debris. Now, the right quick connect system from a professional supplier means they don’t even need to leave the cabin to change a hydraulic attachment. But that is not even news anymore, as there is an assortment of dedicated manufacturers who develop and manufacture fully hydraulic and automatic quick coupler systems for demolition carriers. Leading companies include OilQuick, Steelwrist, Variolock from Lehnhoff, Likufix from Liebherr, EC-Oil from Engcon, and Riedelberger. There is also a rumor that Caterpillar is working on a new fully automatic system. What is definitely new since about a year ago is that other manufacturers have started to develop their own quick coupling systems. In short, there are more options available than ever before, and more to come. The quick coupling system revolutionized the workday for the operator was invented in the mid-1990s by OilQuick from Hudiksvall in northern Sweden. OilQuick, founded in 1952, is now the world’s largest provider of fully hydraulic and automatic quick coupling systems for excavators. It is a modern engineering and sales company, specializing in automatic quick coupler systems not only for demolition excavators, but also for general excavating, wheel loaders, lift trucks, lorry cranes, and material handling machines. OilQuick has experienced very strong growth during the last 15 years and since the beginning of 2000 increased sales tenfold. Today, around 80% of production is exported to Western Europe, Japan, Australia, and the U.S., with the OilQuick OQ range being of particular interest to the demolition industry. The OQ range contains nine different models ranging from OQ 40/24 for 1t-class excavators to OQ 120 for excavators weighing up to 120t. This is currently the widest selection on the market, offering attachment changes in about 10 seconds without having the operator leaving the cabin. Besides the Scandinavian countries, OilQuick has gained a strong foothold in Germany, forging close relationships with several suppliers of demolition excavators. OilQuick also has several subsidiaries around the world, including one in the U.S. Sales of quick coupling systems within the demolition industry are rapidly increasing in the US, and the company will exhibit at the National Demolition Association convention in Colorado. OilQuick also exhibited at the recent DEMCON show in Stockholm. There, Åke Sonerud, part owner and chairman of OilQuick was honored with the Swedish Demolition Awards Honorary Prize. The company is also exhibiting at Bauma with new innovations being expected at the show. 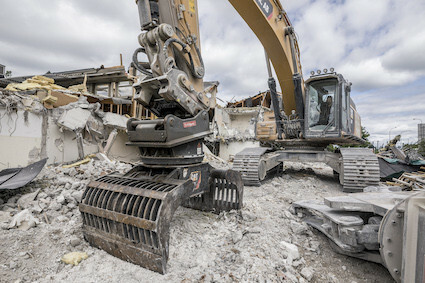 While the OilQuick system was one of very few that was fully hydraulic and optimized for demolition contractors, other similar systems have come on the market in recent years. Steelwrist, also from Sweden, released the SQ Auto Connection quick coupler system in 2017. At the same time, Steelwrist also released new coupling technology called Qplus, with initially two models of automatic quick coupling systems being launched: SQ60-5 for excavators in the 12t-20t range, and SQ70 for excavators in the 18t-33t range. Scandinavia warmly received the system from Steelwrist with this soon replicated in other parts of Europe. During 2018 Steelwrist refined its system and launched a third model, the SQ80, for excavators between 25t and 43t. The Steelwrist SQ Auto Connection couplers follow the ISO13031:2016 standard of a symmetrical wedge locked system. 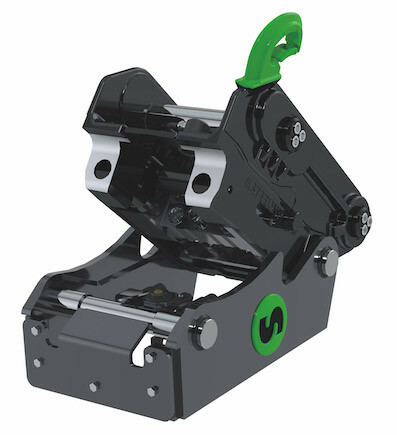 Steelwrist’s SQ couplers and SQ tiltrotators also include patented “Front Pin Lock” technology, which ensures increased safety by preventing the operator dropping work tools by mistake. During the recent Bauma media dialogue, PDa discussed developments with Steelwrist’s part owner and president, Stefan Stockhaus, who noted that the company would release two new models, SQ65 and SQ70/55 at Bauma. The new SQ65 and SQ70/55 will be available for ordering right after Bauma, and deliveries to customers will begin in July 2019. Another development is a new electrical connector for connecting SQ couplers and work tools. The V14 is a robust 14-pole connector that can be retrofitted in existing SQ and OQ type couplers and work tools. Stockhaus also mentioned that additional models for heavier demolition carriers are part of Steelwrist’s future plans. German attachment specialist Lehnhoff will present various new products at Bauma, including the symmetrical quick coupler for excavators in the 22t-32t range. Also new is a hydraulic HS Plus quick coupler system for mini excavators up to 6t, to which Lehnhoff added a safety addition last year. On the proven HS models, the extension of the locking bolt is signaled to the operator by a display pin on the quick coupler that is clearly visible from the cab. 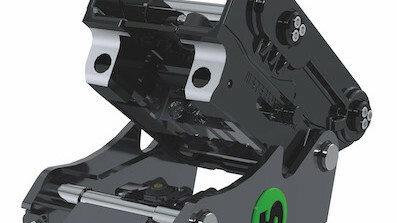 With the HS Plus quick coupler, a release button ensures that the bolt is in the end position. The button is mechanically actuated by the fully engaged attachment, and only then releases the spring force hydraulically. This leads to the extension of the locking bolt on the mini HS coupler. As a result, the user can be absolutely sure that the attachment and the quick coupler are safely and securely connected. Lehnhoff is also launching its latest mechanical quick coupler, MS03-02, which is designed for 1.5t-6t excavators. The company has further developed its series of symmetrical quick couplers by launching the SQ70 fully hydraulic and automatic quick couplers for excavators from 22t to 32t. The Lehnhoff SQ quick couplers are all fully compliant with the industrial S-standard, though the attachment specialist tends to focus on the fully hydraulic version. Mecalac has announced that it will launch a new automatic connection for the hydraulic lines between the machine and hydraulic tool, called “Connect Energy Link.” In doing so, the company expands the performance and versatility of its excavators with an ingenious system that provides automatic connection of the machine’s hydraulic lines and electric cables to the hydraulic attachment. In addition to the improved productivity that naturally results from cutting the amount of time normally spent changing attachments, operators enjoy improved safety and comfort. An intuitive recognition electrically and hydraulically adapts the machine to the attachment taking place thanks to radio frequency identification (RFID) technology. This patented Mecalac innovation combines a sensor fitted to the end of the excavator’s articulated arm with an electronic chip built into the hydraulic tool. With the new Connect Energy Link coupler, attachment recognition is intuitive and immediate. Everything is automatically configured in advance from the driver’s seat, without the operator needing to become physically involved in any way. In addition, there are no more hydraulic settings to manage as the central system takes direct control of adjusting flows and pressure. The Italian demolition attachment manufacturer, VTN Europe, will launch its own fully automatic quick coupling system at Bauma. 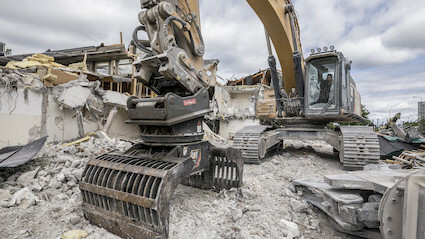 So far, PDa has received very little information about the new system, called “Link-o-Matic,” but we do know it is a fully hydraulic and automatic system where demolition attachments can be changed in seconds, directly, without that the operator having to leave the cabin. The system is to be produced in cooperation with a quick coupler manufacturer, with more information set to be released at VTN Europe’s booth at Bauma. A company that has strongly been gearing up during the last couple of years is Arden Equipment from France. Daniel Dupuy, president of the company, told PDa that the company grew by 18% in 2018, and recently opened a subsidiary in North America. Exports of the company’s products account for 65% of sales, and are said to be increasing. Arden Equipment now has a comprehensive range of attachments for handling, sorting, demolition and recycling applications. Its series of universal shears feature built-in dust prevention, called Arden Jet. The Arden Equipment tool range is set to expand, with a number of new demolition tools will be revealed at Bauma. The entire tool range will be remodeled, with Arden Jet being available on all demolition tools including its breakers in the near future. Arden Equipment also has an extensive range of quick coupling systems for its attachments developed in house, with new solutions for quick tool exchanges set to be introduced at Bauma.